In 2000, Joy’s House Broad Ripple opened its doors to accept its first two guests. Over the years, the numbers of Guests and house have expanded to meet a growing need for services in our community. In 2007, Joy’s House launched a capital campaign to increase the size of the small farm house where it began to 12,000 square feet. In 2009, Joy’s House celebrated our grand opening of the beautiful newly expanded space, designed specifically for the needs of many families who rely on us for excellent adult day service. Additionally, Joy’s House Broad Ripple continues to provide office space for most of the administrative staff. In 2014, Joy’s House Adult Day Service seamlessly assumed operations of Southport Adult Day Center (a former outreach ministry of Southport Presbyterian Church) and continued to serve the established community of Guests and their caregivers as a vital part of the Joy’s House mission. 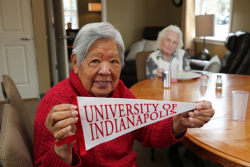 On March 7, 2016, Joy’s House at UIndy officially opened doors for service on the campus of The University of Indianapolis. We are located in the University Heights neighborhood adjacent to the University of Indianapolis’ health pavilion. As a living, learning lab of the University, our Guests enjoy programming, activities, and volunteers from a wide variety of disciplines, including occupational therapy, physical therapy, social work, psychology, and art therapy. Johnson County Community Foundation, Inc.